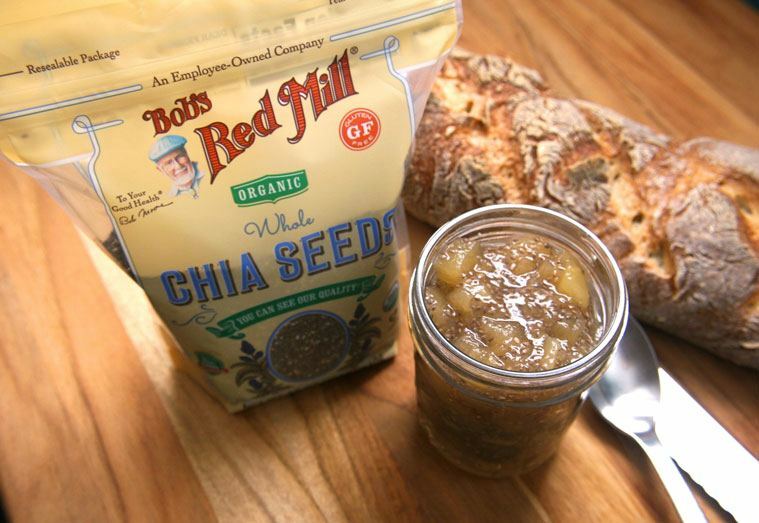 This post, and October Unprocessed, is sponsored by Bob’s Red Mill Natural Foods. I get it, life gets busy. Having the ease of buying things from the store is a great modern convenience. However, the things we sometimes think are easier to buy are not only easy to make, but offer better health benefits than the sodium and sugar-laden counterparts at the store. Enter…chia jam. I will admit, chia seeds can seem intimidating to begin with, but once you get to know them and understand not only what they have to offer you nutritionally, but what they can do for you in the kitchen, you will start adding them to everything. Nutritionally, chia seeds contain a wealth of fiber; 5 grams in just one tablespoon. It is the fiber in chia that causes chia seeds to swell when combined with water, creating chia gel. This makes them ideal for using in chia jam. Not only are they rich in fiber, but they are an amazing source of antioxidants and anti-inflammatory omega 3s. 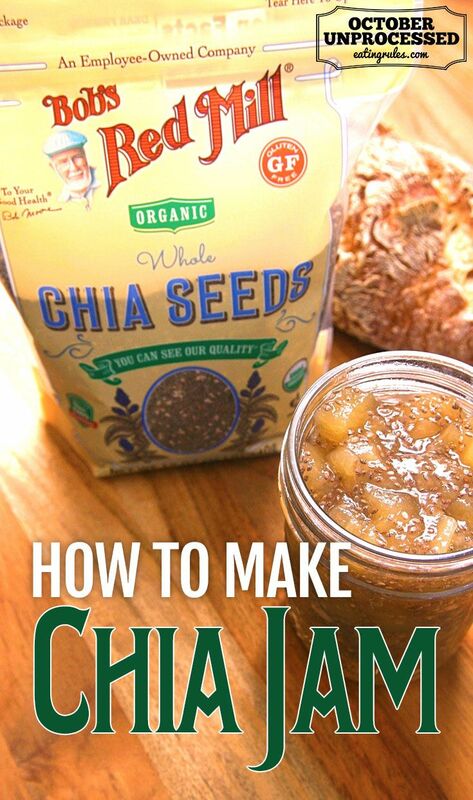 Chia jam is incredibly easy to make and so versatile. I’m sharing my two favorite varieties today to show you just that. Keep in mind, these are really basic recipes. Feel free to add in spices and herbs to make them your own. 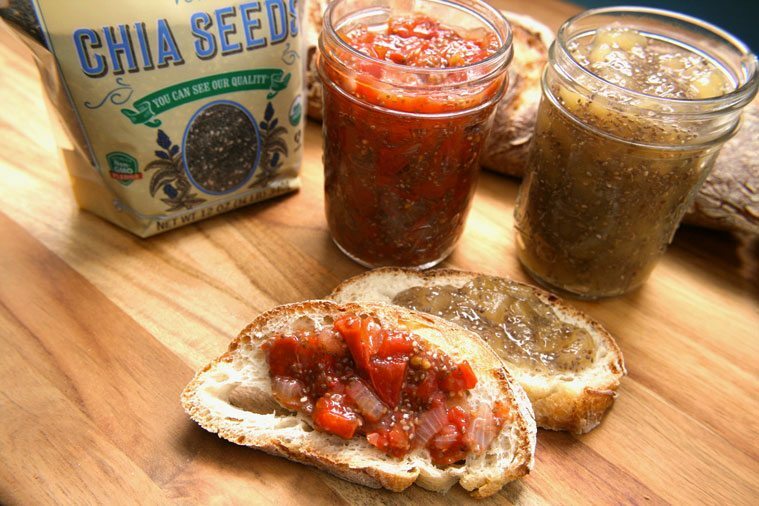 Tomato chia jam is a great savory accompaniment to your cheese platter or as a condiment on a sandwich. The naturally sweet combination of fresh tomatoes and onions with a touch of honey, thickened with chia seeds makes an incredibly delicious spread. The apple jam is simply thick, rich and delicious with a hint of maple. It’s a perfect topper for your toast or as part of a cheese platter at your next gathering, too. 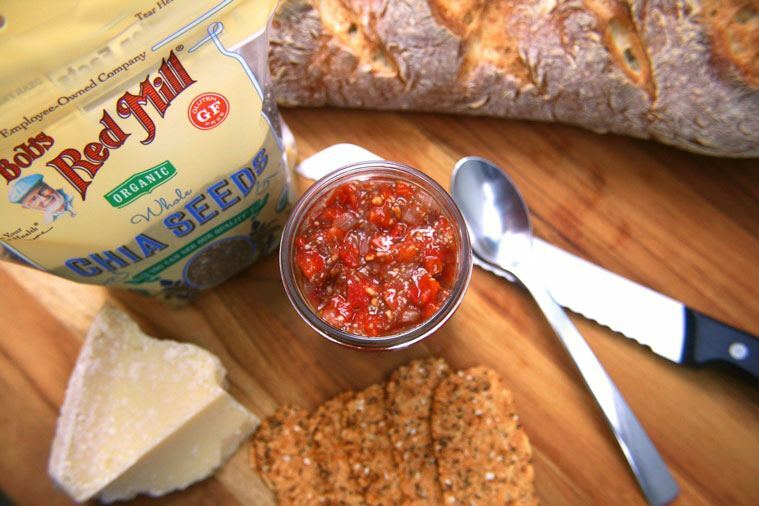 Tomato Chia Jam is a great accompaniment to your cheese platter, or as a condiment on a sandwich. Combine the tomatoes, onion, garlic, ¾ cup of water, lemon juice and honey in a medium pot. Simmer on medium low heat for an hour adding the last quarter cup of water if needed. Once cooked with about a ¼ cup of liquid remaining, remove the mixture from the heat and add the chia seeds. Apple Chia Jam is thick, rich and delicious with a hint of maple. It’s a perfect topper for your toast or as part of a cheese platter at your next gathering. Combine the apples, 1 cup of water, lemon juice and maple syrup in a medium pot. Simmer on medium low heat for an hour adding the last half cup of water (1/4 cup at a time) if needed. Using the back of a spoon, mash the apples to get the desired consistency you want. Thanks for the recipes, I can’t wait to try them! Can you advise how long they’ll last in the fridge? I would recommend using it within a week. It makes a pretty small amount so we go through it pretty quickly. How long can these condiments be safely refrigerated for? A week or two? I plan to make the tomato chai jam. Looks good. It would be so helpful and convenient to have serving size, as well as macros and sugars per serving, posted with these (and all) recipes. If that’s not possible, then measures by weight rather than volume would help to ensure ease in analyzing macros using available online apps.